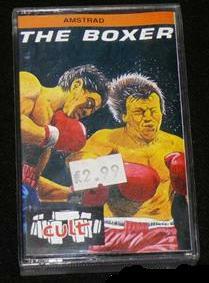 Just imagine the fun you could have with a pugilist (look it up) of your own! Think of the money you could make if he was any good! 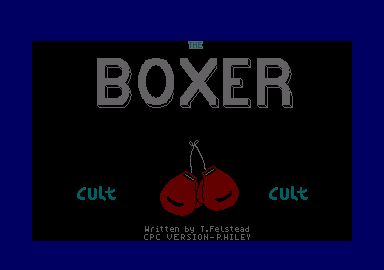 In The Boxer, this is exactly the scenario you are presented with. You are a boxing manager with one promising lad in your care. 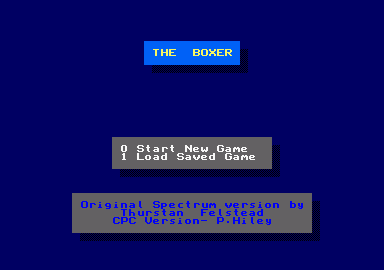 At the start of the game you set up his skills and abilities by allocating points for fitness, stamina, strength, morale and so on. Before each match you must train him in specific skills to raise these values. Then you arrange a venue and an opponent. The opponents range from evil giants with sledgehammer fists to a stunted weakling with a punch like an enfeebled earthworm. Hiring a large venue is expensive. If not enough people turn up, you'll be well out of pocket. Similarly, if your boy gets his head punched in, the hospital fees will mount up. Rioting sometines occurs at the ringside, and you'll also have to stump up for the damage caused by the fans. You can bet on the outcome of any match, though. Betting on your lad might be loyal, but if he's rubbish you'll lose out, so it's best to go for the opponent. It's possible to earn a bijou pile of rhino by watching your lad get consistently beaten. 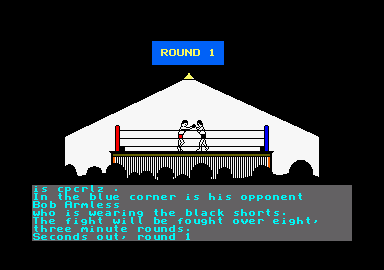 Graphics are simple, but work welL The match is shown on screen as it's battled out, but you don't know how it's going until someone is KO'd. Sound is also simple, but effective; mainly heavy thumping sounds. This type of game is naturally limited owing to its linear and non-variable form, so you won't be playing it exclusively for the next few weeks. However, there are five levels of difficulty, and there is a lot of fun to be had as you try to get the lad in shape for the World Title. A great little budget game, if you like manager simulations.